The merchandising calendar is one the most important tools within a clothing manufacturing company as it greatly assists in the production process. It is this calendar that decides who handles what activity, and when the activity is to take place. This is everything from style development to sales forecasting. The merchandising calendar can seem somewhat daunting and overwhelming at first look, however, once you can clearly understand and know how to read and make a merchandising calendar, it is quite simple. The example provided is one from a budget junior manufacturing company. All merchandising calendars are different according to the company and what their needs are. Activities on the merchandising calendar can vary, but they tend to follow a generic outline. Refer to the sample merchandising calendar provided. You will notice that this company produces for four seasons a year: Spring, Summer, Fall I, and Fall II. 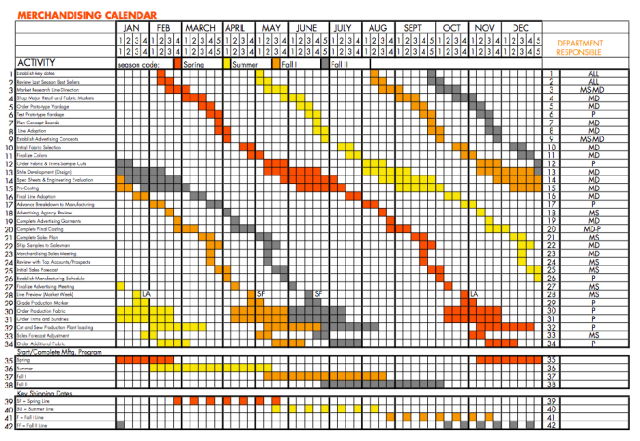 Every season has a color assigned to it so that the colors in the activity section correspond to their season. You will notice that for Spring, the company starts the process in the second week of February, and it doesn’t finish until the fourth week in December; the shipment for Spring starts in the fourth week of February the FOLLOWING year. 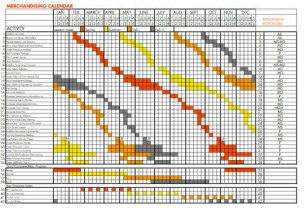 All of the activities start at the top of the calendar and some of the season’s activities continue on to the next year, which is indicated by how the color of the season starts in January towards the middle of the page and below, not at the top. All WeConnectionFashion Worksheets whether bought or free of charge are protected by copyright. You may not under any circumstances distribute these to any third parties, they are for your own use. Please be aware WeConnectionFashion assumes no responsibility for actual or consequential damage incurred as a result of any user’s reliance on this worksheet.